With so many remote access services claiming cross-platform performance, can we indeed connect to a remote computer regardless of the platform? 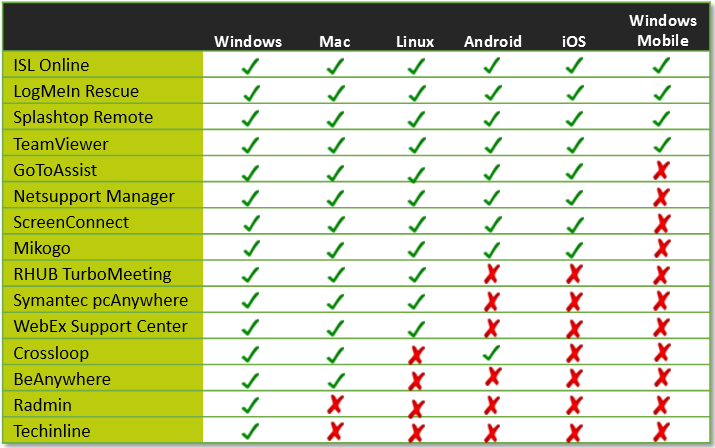 I dug deep into the business remote desktop market, with special interest in the ability to connect from and to any platform and device, and made a comparison of the five best cross-platform remote support software solutions. The big question here is whether users are willing to pay the price for better flexibility and how much money is enough to get great remote support software. The truth of the matter is that having all your clients (and your) computers within reach from anywhere and being able to connect from and to whichever device your operators and clients use makes your support service extremely efficient. You can tech support remote PCs from your office, home, vacation or when on the road. 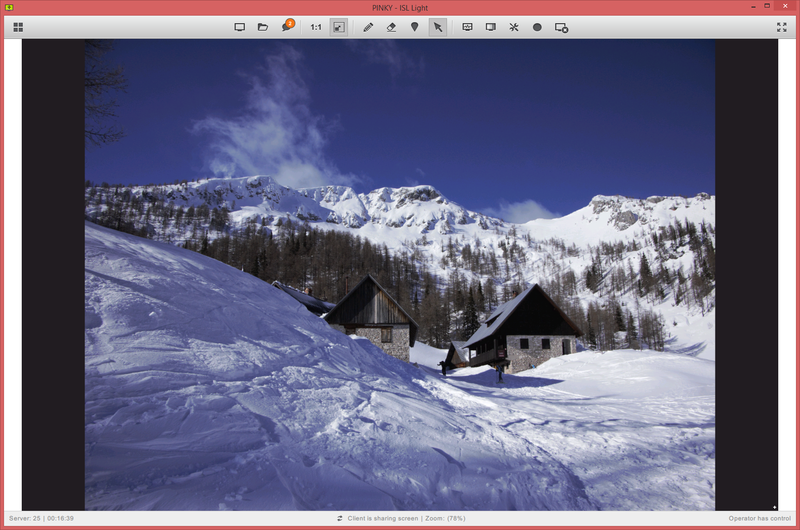 And that’s what good remote desktop software is all about – freedom. The freedom to be mobile, the freedom to use a device of your choice, the freedom to connect to a remote device without even asking about its platform. Let’s look now at what the business remote support market offers and see which software supplies the best functionality at the best price. ISL Online is an all-in-one SaaS and on-premises based remote desktop solution which packs everything a business needs for an efficient customer support service. It includes comprehensive capabilities for spontaneous remote support and unattended access, live chat for a website, and web conferencing for all major platforms and mobile devices. ISL Online is also one of the most technologically advanced and competitively priced cloud-based remote desktop services to let you perform secure, fast and easy remote support from anywhere in the world. ISL Online is priced per concurrent session, charging $469/year/simultaneous session (339€), and does not impose any limits on users, workstations and software installs. Even though LogMeIn stands as one of the most obvious and risk-free choices, their prices for business users are pretty steep. Compared to our first choice, ISL Online, they both assure enhanced user experience with high security, speed, reliability, comprehensive remote support functionality, and cross-platform connections with extra Blackberry and Symbian apps on the LogMeIn side. 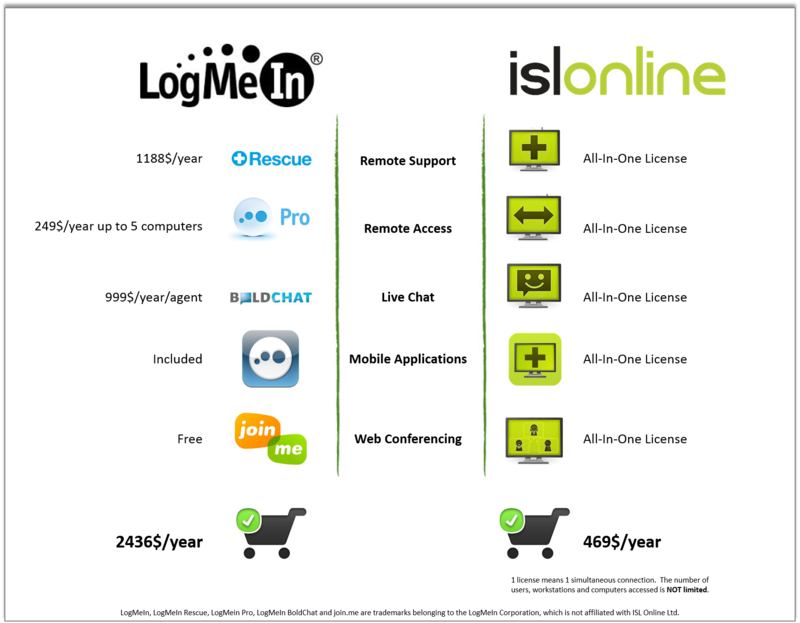 Nevertheless, LogMeIn charges up to five times more than ISL Online and imposes user and workstation limits. Splashtop 2 is unique as it emphasises multimedia and is capable of streaming audio as well as video, plus it works on all major platforms and devices. According to various reviews (1, 2, 3), it still has a lot to work on to catch up with big players, as their users experience problems such as a choked CPU and insufficient dual screen support. However, if you need it for home use and prioritise the ability to play movies and listen to music on your remote desktop, Splashtop Remote Desktop is your best bet. TeamViewer is an all-in-one remote support, access, and online meeting solution. It comes in all three popular OS flavours: Windows, Mac and Linux, while it also works on Android, iOS and Windows Mobile. The software gives non-commercial users almost everything for free – desktop sharing, file transfer, chat, and more- but not VoIP and webcam capabilities. When considering the financial aspect of their software, you will find their pricing on the steep side. One licensed workstation costs $749/year/simultaneous session or $1499/year/simultaneous session for a license without workstation limitations. The tricky part is in their upgrades. The TeamViewer’s license does not expire, however, since upgrades are pushed out regularly, compatibility issues can arise and the so-called lifetime purchase suddenly becomes very expensive. Much like ISL Online, LogMeIn, and TeamViewer, GoToAssist is a comprehensive remote assistance solution with fast performance, standard functionality, and cross-platform connections also from mobile devices (Android and iOS; no support for Windows Mobile though). The client program can be downloaded at will and used to connect the tech supporter with the remote user without a full-blown program. It is quite costly, however, especially in comparison to ISL Online. GoToAssist Rescue is priced per technician, charging $660/year/technician or $69/month/technician. Whether you are looking for a complete cross-platform remote support software package or one that will let you work on limited OS, you need to be aware of the hidden tricks and costs in the long run. Of the covered software, ISL Online seems the fairest choice with its transparent and affordable pricing on the one hand and comprehensive remote support functionality on the other. This entry was posted in cross-platform, isl online, remote access, remote desktop, Remote support and tagged best desktop sharing, best remote access, best remote access apps, best remote desktop, business remote support, cloud remote desktop, Remote Access Software Comparison, remote desktop price, remote support for business, top remote support. Bookmark the permalink.